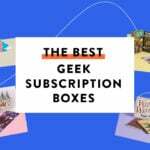 Geek Fuel is a geek subscription box that sends Steam video games, toys, collectibles, an exclusive pin series, plus exclusive and licensed items across all kinds of fandoms! Before we get into the review of April – here is the BIG news, Geek Fuel is moving to quarterly starting with the May box. Get all of the details on this post! Overall, I’m really excited for this because we’ve seen some great exclusive items from Geek Fuel in the past – and hopefully, they’ll have much more time to make them even better! The final monthly box features items from Teenage Mutant Ninja Turtles, Star Wars, Aliens, Infinity War, and, of course, a Steam game. It also comes with a mini magazine. This has a few sections dedicated to interviews and stories – plus the always-awesome gift guide. I’ll miss this guide if it doesn’t make the cut for the new quarterly box! Thanos Infinity Gauntlet Shirt – Value $15? I’m really loving this month’s shirt – and I couldn’t be more excited for the beginning of the culmination of the Marvel Cinematic Universe to finally be on the big screen this week! Who else is checking it out on Thursday night? Pin Palz – Aliens – Value $5-10? This month’s pin series features the Aliens franchise. Here are ALL of the possible variants you could have received. I received the most basic of them, Ripley – while I like my Ripley pin, it’s definitely my least favorite of the options. You’ll get one of 6 NECA scalers – Donatello, Michelangelo, Raphael, Leonardo, Bebop, or Rocksteady. I got Raph. You can hang these from speaker cables, blind cords, and I’ve even got one attached to the side of my iPad once. How do you use these? Any new ideas on how to get these displayed? Next, you’ll receive a little metal Millennium Falcom keychain. Quantum Mechanix makes a lot of great geeky items – including one of my favorite vinyl figures lines – the Q-Fig. So, I was happy to find an item from them in the box, and there’s no surprise that it has some great detail to it. I’m really excited/hesitant about the release of Solo – but, I know that it’ll be a fun ride that shows us the origins of a few characters, and ships, that we love in the Star Wars Universe. This is like a FPS robot game – it honestly had a lot of Lawnmower Man vibes to the graphics! Verdict: I really enjoy this month’s exclusive items – but I do feel like it’s been missing out on the Geek Fuel exclusive creations over the past months, and that’s why I’m excited to see it go to quarterly – I hope that it allows them to deliver so great, unique, items! How are you feeling about the move to a quarterly box? Can you still get this box if you sign up today? Yes! It’s now available as a one-off box purchase or as a bundle option with a new quarterly plan. What did you think of the April 2018 Geek Fuel? I’d just like to see estimated costs of the items, i’m curious how they justify 100$ worth … i see 25 cent trinkets. I’d like to see for once someone actually put values on the undoutably free stuff they are receiving. To be fair, the April box was the last of the monthly subscription boxes which had a guaranteed value of $50. We have yet to see what comes in the new quarterly boxes because they haven’t shipped yet, but based on my experience with Geek Fuel I expect it to be well worth the value.